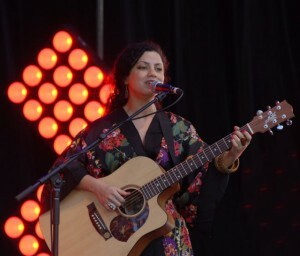 Highlight of the launch was the preview performance by Emel Mathlouthi. She surprised us by starting with a soaring version of the Leonard Cohen classic Hallelujah, her enchanting voice swirling around beautiful Botanic Park. But then she followed up with her own lyrical classic, Kelmti Horra (My Word is Free), a song she wrote at the kitchen table years ago, but which became the anthem of choice, powering the Arab Spring. For the finale we were transitioned from the sublime to something much lighter; four Frenchman from street-theatre company Cie Fracasse de 12 giving us a chuckle with chant, mime and choreographed mayhem with their blue wheelie bins. WOMADelaide’s window to the world is a cultural treasure; for me it’s the highlight of the festival calendar. Come Tuesday I’ll be looking forward to the 2015 WOMADelaide. Campaign passion from Polly Higgins as she discusses criminalising ecocide with Peter Garrett and Tim Flannery. 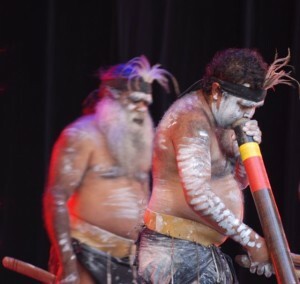 This entry was posted in Activism, Environment, World Music and tagged activism, Billy Bragg, Buika, ecocide, environment, Femi Kuti, politics, Polly Higgins, WOMADelaide, world music by Brian Loffler. Bookmark the permalink.